Students and several faculty members from Samford University’s art department moved last week from their previous facilities in Swearingen Hall into the newly constructed Art Lofts. The new space is located on the north side of campus, across from Lena Vail Davis Residence Hall. A grand opening for the Art Lofts is set for 11 a.m. Nov. 7 during Samford’s annual homecoming weekend. Birmingham-based Davis Architects completely renovated an old facilities management building, giving art majors a space where they can both work and learn in equal measures. Construction was completed just as the fall semester began. Cory also pointed out the open, airy nature of the two-story facilities, and this will foster a sense of community among the students. The new lofts include faculty offices, classrooms and studio space for students to work on their various artistic projects. The Lofts house what are often referred to as the “messy” arts, including ceramics, sculpture and painting. 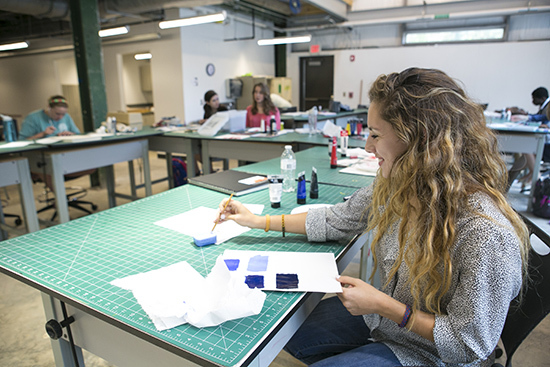 There are even individual studio spaces where students can have their own creative space and work on long-term projects. The art department continues to have space in Swearingen Hall, but previously did not have great place for its students to simply work on their creative projects. An avid painter, McQueen used to have to construct her canvases in Swearingen Hall and then carry the wooden frame across campus to satellite studio space in Brooks Hall.